The Folk House in Bristol, is an amazing place. Not only it’s a cheap cafe serving healthy and nice food, and a roof for exhibitions, gigs and flea market, but it’s as well, and mostly, a unique adult education centre. Nowhere else in town can you find such a variety of classes and workshops. Do you want to learn Spanish, solve cryptic crosswords, take a line dancing or hula hooping class, make knickers or a lampshade? The Folk House offers it all! In weekly classes or on single workshops, this place has something for everyone, and it’s all very affordable. In the past years, I attended a few workshops and weekly classes there, such as hula hooping, samba dancing and pinhole-photography. 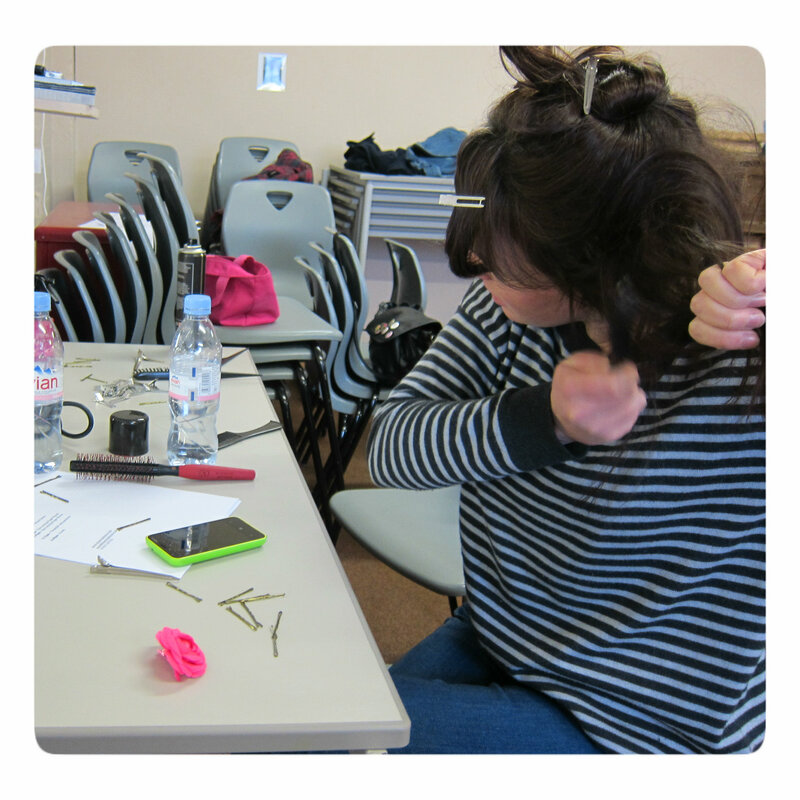 Last year, they added an odd workshop to their beauty list : ‘Vintage Hairstyling’, introduced this way: ‘Have you ever wanted to recreate the glamorous hairstyles from the silver screen? Learn iconic hairstyles from the 40’s 50’s and 60’s. Victory rolls, finger waves, and beehives will be broken down into easy step by step styles to help you complete your vintage look. Not suitable for professional’. 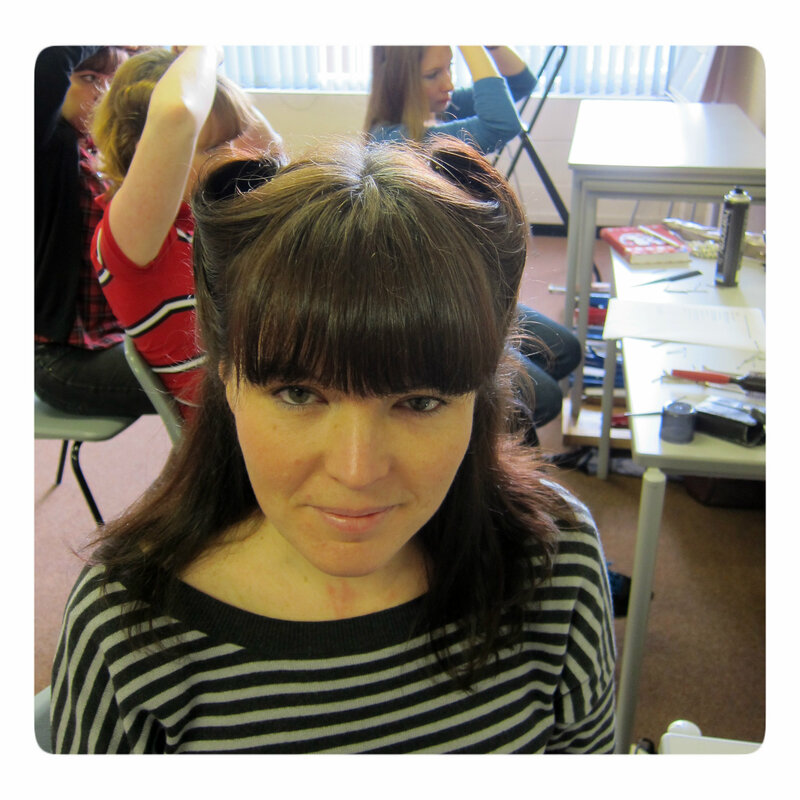 I actually had never dreamed of recreating these ‘glamorous’ hairstyles, neither could I tell what was the hairstyle of the 40’s, 50’s, or 60’s, but the originality of this workshop excited my curiosity. I thought of doing it but I wasn’t free on the dates it was on and I forgot about it. 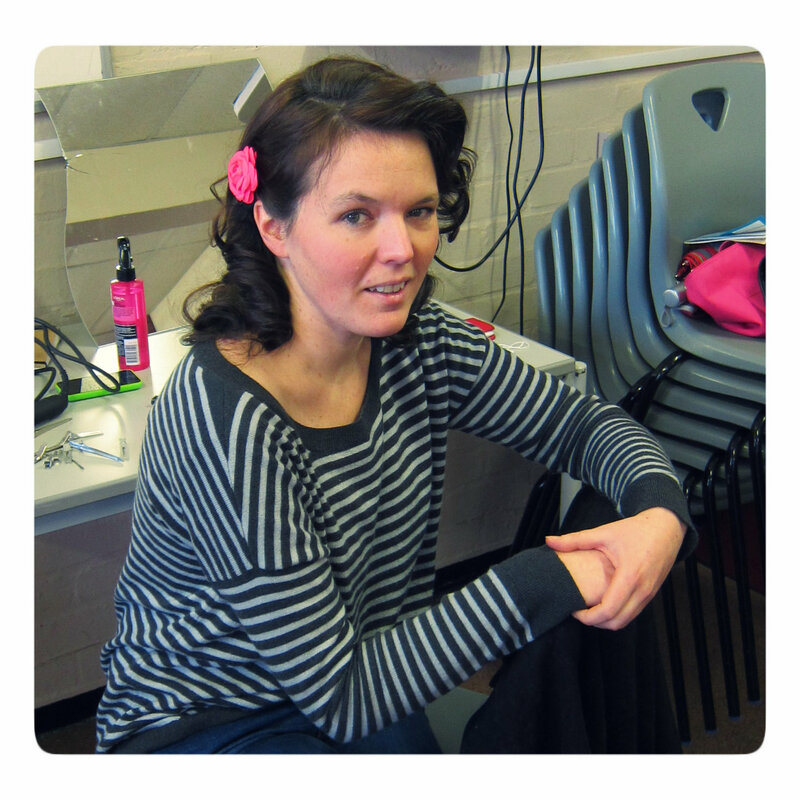 When in December last year, I got invited to a 30’s party, I however remembered about this workshop, and I wondered if the workshop tutor was working in a salon in town where I could get my hair done in the 30s style. That’s how I met Esme from Shear Madness. I booked an appointment with her at Harry Blades, the salon where she is working as an independent hairdresser and she made a terrific job turning my hair into a finger wavy style. Super pleased by the result, the experience and by meeting Esme, I thought it would be interesting to actually attend this workshop and learn how to style my hair in a more sophisticated way than usual. 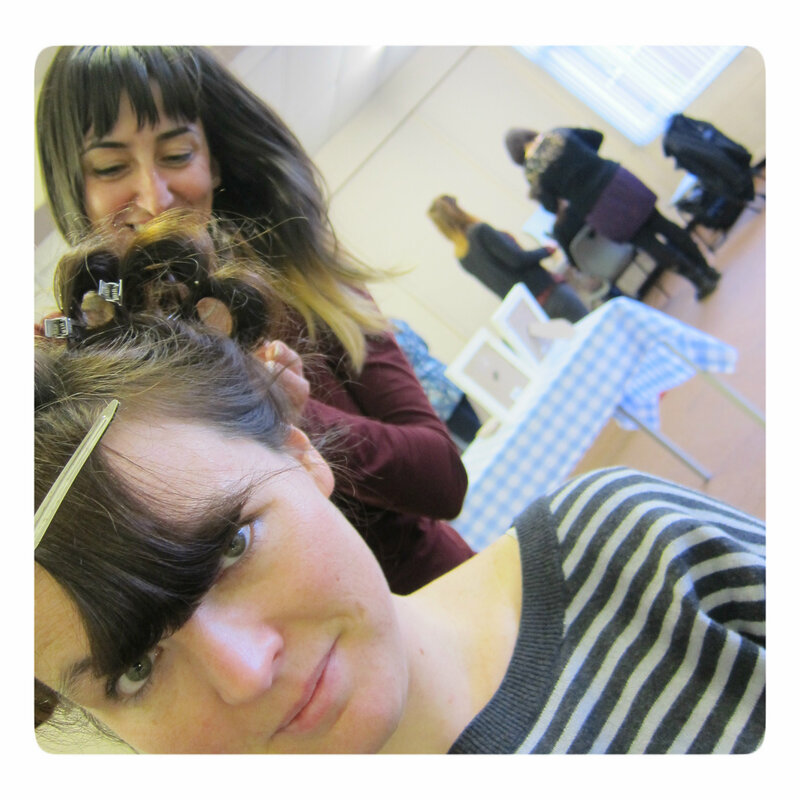 So last Saturday, 2 friends and myself went to the Folk House to learn how to make to ourselves and to someone else, the famous Victory Rolls, Beehive and Finger Waves. In the morning we learned the technique for the 2 first ones and we kept the Fingers Waves (definitively more time-consuming and more difficult than the 2 other ones!) for the afternoon. It was fun, and difficult! Like everything, it will take practice to become easy but I wonder how much practice it would take! 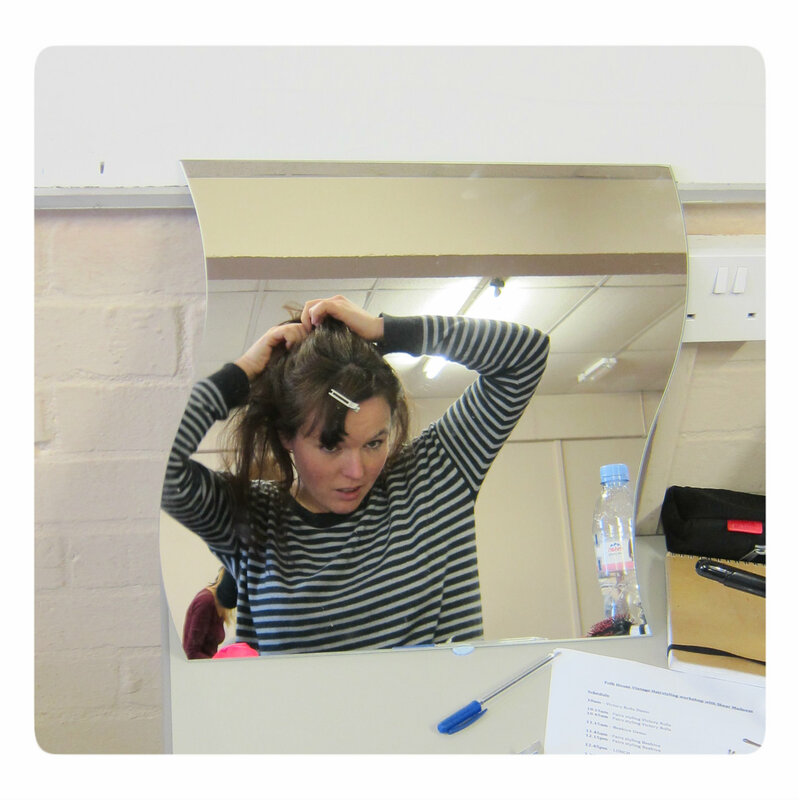 The Victory Rolls are not too difficult to do to someone else, but to one-self it’s another story! You would think that one side might be easier than the other one, but if on the left, it’s easier to roll your hair, it’s actually tricky to pin the roll, and it’s the opposite on the right side. The Beehive is a style I ‘should’ manage to re-do to myself more easily… I’ll actually give it a go this coming weekend,, that should be interesting! As for the Fingers Waves, we didn’t have enough time to try on ourselves, but even on my friend I did a poor job (I burnt her ear!) so I might keep that one to professionals. 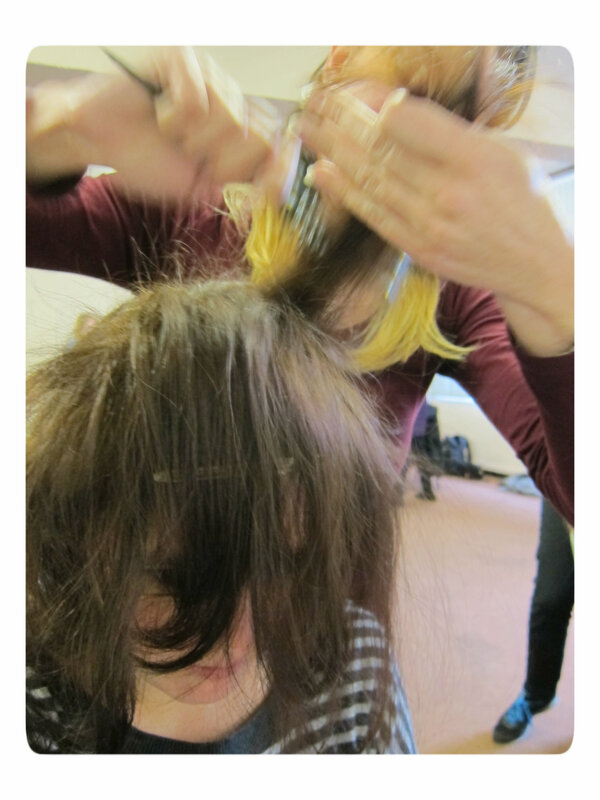 It was overall a fun experience and will certainly make me thing next time I need to ‘do my hair’. Rather than straightening them like I would do for special occasions, I’ll give a go at something more stylish. I might even watch a tutorial or two (crazy, I know!) to learn a few more tricks.